Looking at the 2015 Bourbonette Oaks with Casey: Many fillies have utilized the Bourbonette Oaks as a step towards a possible start in the prestigious Kentucky Oaks. This year, Sharla Rae is the morning-line favorite but must take on a full field of twelve to earn points toward the Oaks. Back Flip may be a fan favorite but isn’t a top choice here. Can she improve and possibly move towards a start in the Kentucky Oaks? What about another competitor in this field? Fillies in the past five years of the Bourbonette Oaks have either not started in the Kentucky Oaks or not fared well in the race. 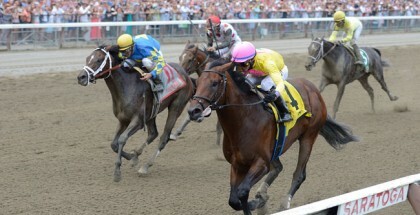 However, In Lingerie did win the Black-Eyed Susan after her Bourbonette win. Since the race’s inauguration in 1983, no filly has completed the Bourbonette-Oaks double. Is this the year a filly finally does? Only time will tell, but this full field is full of potential. Urtheoneeyelove (Congrats – One Eye Love, by Quiet American) – This filly broke her maiden at Turfway going 6-1/2 furlongs over the all-weather track. Since then, she ran second and claimed a win in an allowance optional claiming event at Sam Houston, and the runner-up in her maiden race did come back to win her next start. Her last start was a winning one where she traveled 1-1/16 miles on the turf. Her pedigree is balanced with both turf and dirt influence, so the synthetics should be no problem for her. Walking the Kitten (Kitten’s Joy – No Deadline, by Skywalker) – This filly hasn’t fared well for the Ramseys. In her only win, she won going a mile at Kentucky Downs. Since then, she hasn’t hit the board and did not finish in the Wait a While Stakes at Calder. She is going to have to vastly improve to be considered even a minor threat here. Don’t Leave Me (Lemon Drop Kid – See How She Runs, by Maria’s Mon) – With a more than classic-oriented pedigree, this filly is making her 2015 debut. She was last seen finishing sixth in the Grade II Natalma Stakes won by Conquest Harlanate over Isabella Sings. Having raced solely at Woodbine, the temperature shouldn’t be a concern as it would be in the southern states. This filly sits about midpack before moving into contention. Look for her turning for home. Right On Kitten (Kitten’s Joy – Right On It, by E Dubai) – This filly is another for Ken and Sarah Ramsey but another that is likely going to have to step up her game big time. She broke her maiden at first asking at Indiana Grand going 7-1/2 furlongs over the turf before winning a stakes at Retama Park. Since then, her two starts of 2015 have been off-the-board finishes in two stakes races at Gulfstream and Turfway. Back Flip (Super Saver – For Royalty, by Not for Love) – This filly became an overnight sensation when a video of her attempting to stand shortly after being born showed her “back flipping.” Since then, the filly has grown into a racehorse. Her maiden score came in a 1-1/16-mile maiden race over the Calder turf course. Since then, she has finished second and third in her two previous starts. She has the distance pedigree, but is she a turf, synthetic, or dirt horse? Harlan’s Destiny (Harlan’s Holiday – Mantekilla, by Lemon Drop Kid) – In five lifetime starts, all coming in 2014, this filly has a 5-4-0-1 record. 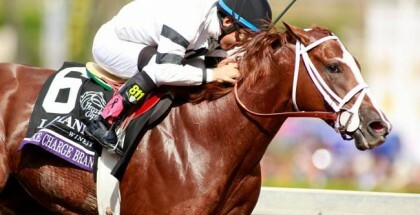 She has also traveled to three different tracks and is a three-time stakes winner. In her only non-winning start, she was running over an all-weather track, which is what she will be racing on here. She obviously has fantastic dirt form, but has she gained enough experience to come in and win here, avenging her only loss? Sweet Success (Candy Ride – Aspiring, by Seeking the Gold) – Just recently breaking her maiden at Gulfstream going six furlongs, this filly has breeding that indicates she will appreciate stretching out. Candy Ride has sired runners over all surfaces, so the all-weather track should not pose too much of a hindrance. Her works have been good, so this homebred stands a chance to pick up Oaks points here. Flat Deposit (Flatter – Bank Deposit, by Brahms) – This filly is one of three for trainer Mike Maker in this race, but while she is consistently running well and hitting the board, she only has her maiden score to her credit. She achieved stakes-placed status when she ran third in the Cincinnati Trophy Stakes, but she has yet to deliver a performance that puts her on the map as a real threat. Sharla Rae (Afleet Alex – Jinny’s Gold, by Gold Fever) – This filly is the morning-line favorite for this race, and for good reason. She has four wins in eight career starts, three of which have come in stakes races with her last one being the California Oaks at Golden Gate. She may not be a top class filly, but she, on paper at least, is worlds better than the other fillies in this field. The surface and the distance should be no problem. Sweet On Smokey (Successful Appeal – Clochard, by Devil’s Bag) – As a two-year-old, this filly ran seven times in four months. Her shortest turnaround was fifteen days, but her only win came in a maiden race at Parx last November. 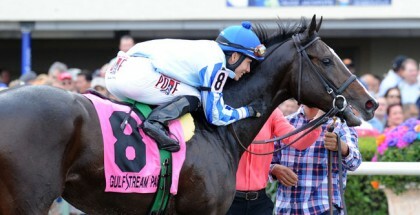 Her two races this year have resulted in a fourth and a third in the Busanda and the Busher at Aqueduct, respectively. College Holly (Super Saver – Maddie’s Promise, by Dehere) – This filly has one win in four starts. Her last race was her maiden score, coming at Oaklawn going one mile on the dirt. Her pedigree does teeter towards dirt, but the all-weather surface should not be a huge concern. Her works are less than spectacular, but she does have room to improve here. Bossy (Street Boss – Profit Girl, by General Meeting) – This filly has two wins to her credit in six career starts. Her owners, Eclipse Thoroughbred Partners, have been prominent in the industry for a long while, most recently making Kentucky Derby noise with Danza last year. This year, they hope to get Bossy to the Oaks with a win here. She was second last time out in the Cincinnati Trophy Stakes at Turfway, and she should have no problem with the distance or the surface. Uncontrolled and Christie’s Ready are also eligible for the Grade III Pure Romance Bourbonette Oaks which is set to run Saturday, March 21, 2015, at Turfway Park in Florence, Kentucky, right outside of Cincinnati.